In the land of the fat saturated, genetically modified hotdog, it’s easier than you think to eat healthily, if you know where to look. While soulless supermarkets expand across America, turning food shopping into task management, farmers’ markets put the soul back into eating well. Small country towns from Maine to Hawaii provide school grounds, council squares and public parks to entrepreneurial local growers keen to see their goods sold directly to consumers rather than to anonymous wholesalers. Now it’s rare to find a country town that doesn’t have at least one devoted market day per week on its calendar. Farmers’ markets have become nexus points where community interaction dominates localised good food networks. They’re also where savvy travellers go to check out what’s happening on the local scene. If you’re bored in Middle America, a visit to the farmer’s market is the place to find a quick cure. On a trip to northern central Indiana, I luckily discovered a hungry traveller’s ironical feast. A sunburnt, grizzled local grower told me that, ‘We got all kinds of termatoes growin’ round here, big red ones and little green ones.’ Discussing the possibilities of pickling the unripe green ‘termatoes’ (tomatoes), we agreed that the big red ones tasted best eaten right off the plant, warmed by the sun. As social centres, markets are invaluable. Check out www.localharvest.org for a listing of farmers’ markets operating across the USA. The Waipa Foundation based in Hanalei, Kaua’i sets the pace, an inspiring volunteer operation where travellers are welcomed with open arms. Each Thursday morning, interested visitors (register your interest online to ensure a place) are invited to help with the weekly poi making. Made from boiled, mashed and fermented taro, pure Waipa poi is packaged for sale during Tuesday’s weekly public market. Pulling taro at Waipa farm on Kauai. Part of the joy here is the rare chance to ‘talk story’ with real Hawaiian people. ‘Talking story’ is exchanging histories while having a chat. The people of Hanalei are some of the friendliest in all Hawaii. See www.waipafoundation.org to get a place at the taro peeling table. If you’re lucky you may be asked to stay for lunch. This is as far from Honolulu’s tacky beach tourism as it gets. Taro is the lifeblood of ancient Hawaiian culture. This most remote archipelago on the planet was always a difficult place in which to find food. First Hawaiians brought taro with them on their voyages across the Pacific Ocean. As a supplement to a primarily protein based diet, it was essential to good health. Over a thousand years later, poi represents the renaissance of Hawaiian culture itself. Making poi in the old way near the shores of Hanalei Bay is experiencing true Hawaiian culture and the emergence of green food tourism. San Francisco Ferry Terminal exterior. California arguably claims to be the birthplace of America’s organic food revolution. Esteemed chef Alice Waters opened Berkeley’s acclaimed Chez Panisse restaurant (see www.chezpanisse.com for reservations) way back in 1971. The Chez Panisse kitchen used locally sourced organic produce well before the practice became fashionable. Chez Panisse sous-chef Carrie Wilkinson tells me, ‘Forty years later and Chez Panisse is still trail blazing. As much of our menu as possible is sourced locally and is organic.’ Locavoring, sourcing all supplies locally to avoid fuel waste, is the latest buzzword to enter the restaurant world. Chez Panisse was carbon offsetting well before climate change entered public consciousness. The USA green food movement gains inspiration from indigenous traditions. In this country of new migrants, tradition has simultaneously remained important. Native Americans maintain significant influence over localised food scenes, nowhere more so than in New Mexico. The area around Santa Fe and Taos in the state’s north is noted for its organically raised sustainable food driven culture. For a city with a relatively small population, Santa Fe is blessed with restaurants specialising in regional cuisine sourced from organic produce. Fajitas stall in Santa Fe’s main town square. Green is good has been a slogan here for decades. It’s an arts city fuelled by an extraordinarily sophisticated dining culture. 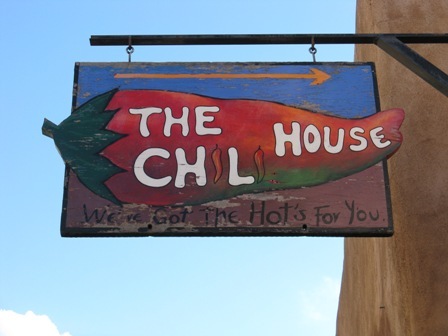 Check out the Coyote Café (www.coyotecafe.com) or Café Pasqual (www.pasquals.com) to discover what’s hot on the sustainable food scene in New Mexico. The Midwest is historically strongly connected to the land. Surprising given its industrial roots, Chicago is one of America’s greenest cities. (See www.explorechicago.org for a listing of green hotels, green restaurants and green buildings.) Chicago’s 7 million plus square feet of green roofs comprise more than all other USA cities combined. Rooftop gardens have literally sprouted up all over this huge metropolis, like broccoli flowers on tall stalks. One of Chicago’s many private rooftop gardens. The green food movement here relies heavily on its famously enthusiastic adherents. Star-studded chefs like acclaimed Grant Achatz (who trained under Charlie Trotter’s guidance) at Alinea (see www.alinea-restaurant.com for reservations) embraced sustainable harvesting practices right from the get-go of their illustrious careers. Wisconsin is known as the Dairy State. Though encumbered by mass production (tasteless ‘cheese curds’ remain a popular snack), an emergent artisan cheese industry is taking keen restaurateurs and purveyors by storm. Wisconsin is brimming with picture postcard farms, especially in the hilly southwest region. The scenery here is some of America’s most bucolic and peaceful. See www.eatwisconsincheese.com and download its Traveler’s Guide to see how far an artisan organic cheese adventure will take you around the dairy state. Be prepared for a surprisingly long trip. At latest count, 44 artisan cheese makers are plying their wares to the public. Naked Tip: Don’t miss Frank Lloyd Wright’s studio at Taliesin outside Spring Green. Known as the father of ‘Organic Architecture’, Wright’s buildings are a synthesis of the natural environment melding into personal space. See www.taliesinpreservation.org for directions and opening times. Part of Taliesin’s extensive garden. There is a strong green food movement operating in the Piedmont region. Food activists such as Barbara Kingsolver (see her 2007 book ‘Animal, Vegetable, Miracle’) and Michael Pollan (see his ‘The Omnivore’s Dilemma’ published in 2006) have written extensively about the so-called ‘catchatarian’ and ‘locavorian’ movements, based on living off the land, using all local ingredients. Naked Tip: America’s third president, Thomas Jefferson, was an avid gardener and started one of the world’s first seed banks. His heritage property Monticello (see www.monticello.org for details and visiting times) located in the foothills of Virginia’s Shenandoah Mountains near Charlottesville has recreated the original kitchen garden, all organic. Around Asheville, North Carolina another green food movement has evolved, this one based on foraging from the enormous quantities of food Americans continue to waste each year. Though rummaging through rubbish bins is potentially a risky route to gourmet green eating, it’s a concept that has taken off among people who are trying to avoid the worst excesses of America’s dominant agri-business driven consumerist society. Clover, (a pseudonym) is one of seven followers of an underground food movement sharing an abandoned house in central Asheville. He says, ‘We’re just living way simple, super low-impact, deep green.’ The house has been repainted greenish grey, courtesy of twenty-three cans of leftover paint from Home Depot. ‘We don’t dumpster McDonald’s,’ he adds but leftover sushi is okay as long as it didn’t sit in the rubbish bins overnight. For more information about America’s newest hunting and gathering revolution, read green food activist and writer Sandor Katz’ books, ‘Wild Fermentation’ and ‘The Revolution Will Not Be Microwaved’. A useful guide for hungry green-going visitors is www.eatwellguide.org, an extensive listing of restaurants, farm shops and markets around the USA and Canada. Not all Americans look like this. Though many Americans continue to live gratuitously off the land, getting fatter by the day, the green food movement is well established despite whatever MacDonald’s may advertise to the contrary. Tom Neal Tacker travelled courtesy of United Airlines, Hawaiian Airlines, Hawaii Tourism and New Mexico Tourism.